Yes, I'm clamoring for the comeback. Happy now?!? December 31st, 2006 was the last time we saw embattled star, Michael Vick, play quarterback in the NFL. On Monday, the former top pick in the NFL draft was released from prison after a 23-month sentence on federal dog fighting charges. Before NFL teams begin to have internal discussions, (if they haven't already), regarding the future of Michael Vick in the National Football League, the decision looms over the head of it's most notorious no-nonsense commissioner, Roger Goodell. Whether Goodell decides to grant Vick a second chance or not, I've decided to throw my three cents into the ring. Hell, If the NFL won't take him maybe even I'll start up a future defunct football league in the coming years. Cent 1: The Falcons are just fine. Of course you've heard us wax poetic about the Matt Ryan era in the A-T-L. But if you haven't . 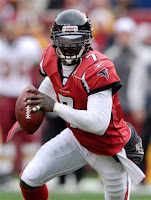 . . the former Boston College quarterback made Falcons fans forget Mike Vick faster than we ever thought. Hey, I felt bad for Arthur Blank as well. However, Mr. Blank delivered a game plan to bring the Falcons back and implemented it to perfection. Bring in a Patriot, former New England Director of College Scouting Thomas Dimitroff to run your franchise. Hire all-business Jaguar defensive coordinator, Mike Smith. Follow it up with Charger 2-back turned Falcon All-Pro Michael Turner. FRANCHISE MOVE: Following those moves with drafting the most pro-ready quarterback since Carson Palmer, the one they refer to as ICE, Matt Ryan. A near instant hit in the NFL, Ryan earned offensive ROY honors in 2009, oh and the Falcons reached the first round of the playoffs on a wild card bid. Ryan isn't a flash in the pan quarterback, nope. Matt Ryan is just what the doctor ordered in Atlanta. A pro-bowl style quarterback who knows one thing, football. At the end of all this, name a team who came out looking better than Atlanta? Exton, PA in the house. No matter what Michael Vick put them through, this team actually came out better. Maybe it isn't no harm no foul, but it's close enough. Cent 2: He's got a thrill or two left in him. What? Your going to disagree? Has anyone been watching the offseason? The Vikings are planning on a Tavaris Jackson/Brett Favre mixture. David Garrard and Jason Campbell? Please. Possible Super Bowl contenders are looking toward QB's like this? Kill some dogs and your anthrax? Goodell isn't putting this guy in play yet, give him three months of top training and you don't think he'll remember what it's like on Sunday afternoons? The guy won at Lambeau for Christ sake, did you forget that? Recall how the Dolphins beat New England in 2008? Recall Pat White getting drafted? Michael Vick is those things 5x over. Four of Vick's six professional seasons he rushed for well over 500 yards. One doesn't do that with luck, they do that with talent. You tell me the '09 story that'd be bigger than Mike Vick sprinting down the sideline with time remaining in the NFL? As the teams faithful rally around him, Michael Vick would be up to some of his old tricks. Hey, start clamoring for it and we'll get to see it. Cent 3: 5-10, That's all the quarterbacks we've got.Tom Brady. Eli & Peyton. Big Ben & Joe Flacco. Phil Rivers & what is left of Carson Palmer. Drew Brees, McNabb, Romo, & Matt Ryan. That's it. You can run off some names of guys who've stayed relevant, but I'm not buying it. Not one of these quarterbacks is injury free, see 2008 Tom Brady. Mike Vick can play backup, Eagles fans, Patriot fans, Cowboy fans, and Steeler fans would all embrace this guy, just ask 'em. There isn't enough quality talents in the NFL for all of them to be overlooked, but as the play of quarterbacks decline we've got to ask who is in the waiting. The rookies like Mark Sanchez and Matthew Stafford, ask yourself whose more ready? The more days that go by the more dangerous potential Vick suitors get. He'll be able to play, just like Lenon when he left the Bettles, he'll always want in and he can show it. As Mike Vick returns from prison I've got just two messages I'd like to relay to the former NFL Stars fans. This was for me, anyone who misinteprets that, find a new job. Michael Vick did something terrible, but he's allowed to walk among us, believe that.